Sosha tries to deny that she has peed in her diaper, but Alisha doesn’t buy it and checks to see if she is wet anyway. Once Alisha discovers that Sosha is wet, she changes her, putting her in a fresh diaper. In this video we find Sosha laying on her bed wearing a t-shirt and a thick, tabbed diaper. 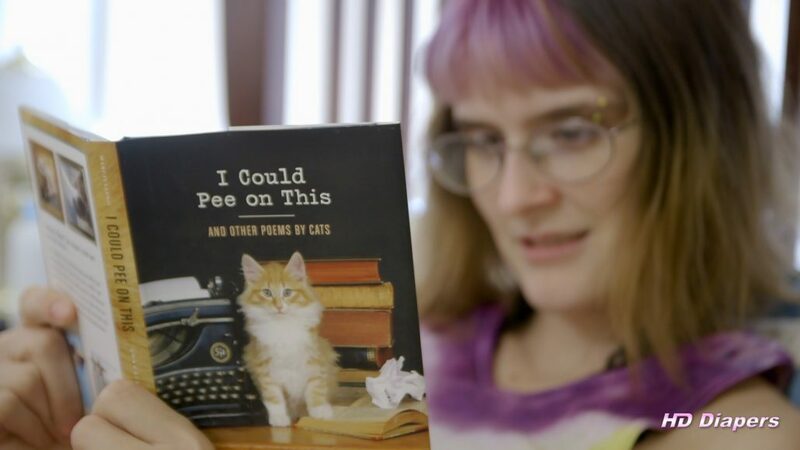 She is reading a book entitled, “I Could Pee on This,” which is perhaps what inspired her to pee in the first place. Regardless of what her motivation was, she has peed in her diaper. This is a fact that she attempts to deny when Alisha comes in to see if she is in need of a change. Alisha is not convinced by Sosha’s denials. She insists on checking to see if Sosha has wet her diaper, only to discover that she clearly has. Sosha, it turns out, is badly in need of a change. Fortunately, the diaper changing supplies are close at hand. We get to watch as Alisha lovingly changes her friend, carefully removing Sosha’s wet diaper, cleaning her with baby wipes, applying powder, and finally securing her in a new, dry, diaper. The video comes to an end as Alisha leaves Sosha, asking her to try to go at least two hours before she needs to be changed again.